What would you do with $220? What would you do if someone offered you $220? Book a flight for a weekend away? Put it towards next month’s rent? Or invite your friends out to the bar on a Friday night? The responses to this question will depend on who you are asking, but you’d be surprised at some of the answers Blue Dragon staff received when they asked that very same question one year ago in the central Vietnamese province of Hue. One woman said: ‘Open a hair salon’; another said ‘Buy chickens’; yet a third decided to ‘open a fish shop’. Welcome to the world of Microcredit, where very small loans have the capacity to make very big impacts. Blue Dragon has been working with impoverished communities in Hue province to combat child trafficking since 2006. When we first visited the region, children aged 11-16 from very poor families were being enticed or forced to quit school and go in search of work, far from home. The promise of an income is strong and many families, in desperate need, saw no alternative but to allow their children to work in order to make ends meet. The reality is very different indeed. Children often end up working dangerous jobs in appalling conditions for 100 hours a week or more. Blue Dragon’s efforts to return trafficked children to their families and provide educational programs on the dangers of child labor has resulted in a dramatic decrease of such incidents over the past 10 years. Now, in a new initiative, we are going one step further by helping families build their incomes so that they will never again be tempted by the traffickers. 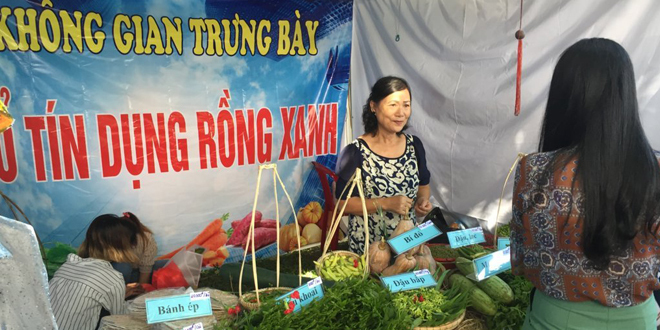 A year ago, in collaboration with the provincial Women’s Union, we launched a microcredit project in Hue as part of our strategy to help poor families create a pathway to financial stability. ‘Microcredit’ refers to a small loan provided at a low-interest rate to people in severe poverty to help them become self–employed. In other words, it’s a tool to help small entrepreneurs start their own business. We wanted to help vulnerable families with children who have either been trafficked or are in real danger of being so. The strategy was to provide the identified families with a small loan so that, in time, they would be making enough profit from their enterprise to keep their kids in school and avoid the perils of child labor. Working exclusively with mothers, loans of 5 million VND ($220 dollars) were made available. The project started in March and has another year to run as a ‘pilot’ program for testing and improvement. Providing small loans to women in poverty can make a real difference in the fight against human trafficking. It empowers women by providing them with an independent income stream. As their small business endeavors begin to prosper and grow they can see the tangible results of their efforts at home. More food on the table, school supplies for the children and a safer environment, free from the threat of traffickers. In the words of Australian singer/songwriter Paul Kelly, “from little things big things grow”! In the meantime we at Blue Dragon will continue to support these women and their fledgling projects and we will continue to keep you updated on their progress over the next year of the program.